Listed below is the music for the orchestra’s next four meetings. Please note that the music scheduled for the November 9 meeting has changed from the selections listed in the October issue of Upbeat and that the meeting on Monday, December 5, will take place at Grace Lutheran Church, 3149 Waverley Street in Palo Alto at 7:30 P.M. as will the meeting on Friday, December 9, which is the dress rehearsal for the orchestra’s holiday concert. The holiday concert will take place at Grace Lutheran Church on Sunday, December 11, at 2:30 P.M. All those planning on taking part in this performance are expected to attend the dress rehearsal on December 9. As in the past, small ensembles are encouraged to appear in this concert. Those groups that intend to perform at the holiday concert are asked to send me the following information by November 18: the title(s) of the music to be performed, the name(s) of the composer(s), the name of the ensemble (if any) and the names of the ensemble's members. 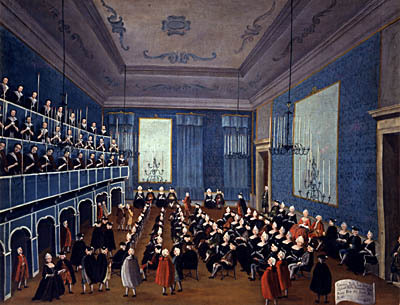 Please note that at the meetings on November 9 and November 30 there will be sectional seating for the Telemann La Joie, with those playing Soprano Recorder 1 and 2, Alto Recorder 1 and Tenor Recorder 1 sitting on the right as they face the conductor and those playing Alto Recorder 2 and 3 Tenor Recorder 2 and Bass Recorder 1 and 2 on the left. Please observe this seating arrangement when you choose your place at the beginning of the meetings on November 9 and November 30. Seating charts will be used for the meetings on December 5 and December 9 as well as the holiday concert on December 11. Please note as well that contrabass recorders and bassoons will be needed at all four meetings, great bass recorders on November 30, December 9 and December 11 and sopranino recorder and krummhorns on November 9, December 9 and December 11. Grace Lutheran Church, 2:30 P.M.